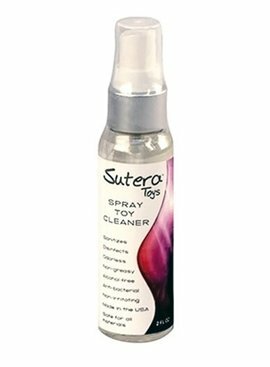 Use Sutera toy cleaner to remove unwanted bacteria, and dirt with its gentle cleansing action. Sutera Toy Cleaner works on all toy materials and is completely safe. Wicked Foam n' Fresh Toy Cleaner is anti-bacterial, but triclosan and alcohol-free. This super powered foam is enhanced with Olive leaf, Thyme and Lavender extracts, making it safe for all toy materials yet dangerous to germs. Skin safe. 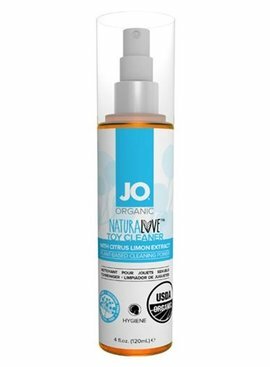 This gentle, soap free cleaner provides you with a natural toy care option. Simply spray the cleaner on the toy, let sit 5-10 seconds, and rinse clean. The organic lemon fruit extract works quickly to keep your toys ready for play. Take care of intimate items with JO Refresh Foaming Toy Cleaner. Simply apply a coating of foam to toy and leave on for 5-10 seconds before rinsing clean. This gentle and fast acting formula makes cleaning intimate toys easy and safe. Join today and get exclusive offers, announcements on the latest products, helpful tips and more -- plus receive a 20% discount coupon upon confirmation!